Goodreads: One enchanted summer, two couples begin a friendship that will last more than twenty years and transform their lives. Kritters Thoughts: Dorothea Benton Frank is one of those authors when pitched their book by anyone I don't read the synopsis, I just say YES! I picked this book up and by the first few chapters I was nervous this was going down a road I wouldn't enjoy - cheating couples and such, without spoiling TOO much there may be a little of it, but it by no means was as much as I thought it could be. So let me back up a little. There are two couples and a man and woman from each couple have a little bit in their past, their high school days, but happen at the same vacation spot with kids in tow and from there their lives take a turn. I love how they come and go out of each other's lives but clearly make an impact. The epilogue just sealed the book with a great bow, not a nice and pretty bow and there is room for another book to follow (please! ), but a great bow that made me really end the book with a smile on my face knowing where these two couples were headed next. I love her writing. I love her setting. I love her characters. 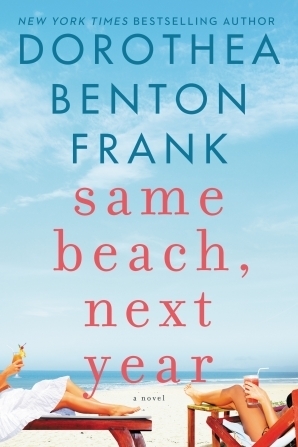 Dorothea Benton Frank can just do a great book. I will still continue to say yes to reviewing her books without a synopsis in hand. A special shout out that is semi unrelated to my thoughts on the book, the daughter of one of the couples headed to Elon for her college education and it was just fun to see my alma mater show up in a book! Don't you just love it when an author delivers fabulous reads again and again and again?! I'm so glad this was another winner for you from this author.